Maximise the lifespan and value of your car with regular car servicing Warrington with Autostop! Our expert technicians are trained to service any make and model of car using the latest techniques and diagnostic equipment. We are committed to providing a friendly, straightforward and honest service. We also have a Renault Specialist in our team. On average our prices are up to 50%** cheaper than main dealers for a full car service, so why not check what’s included in our servicing and see if our offers can save you money? Here at Autostop Service Centre in Warrington we offer full van and car servicing Warrington & Runcorn area. We are Trading Standards approved so you know your vehicle is in safe hands when you are with us. Contact us today to book your car or van in for a service now. This 6 month, service is designed for the high mileage car user, or where the manufacturer recommends more frequent checks. This service helps maintain your vehicle and prevents unforeseen faults. Included are changing engine oil and oil filter, top-up screen wash fluid, check & adjust the lights if needed and a wide range of checks on the fundamental items. This is a very comprehensive annual service for trouble free motoring. It exceeds most manufacturers service schedules with wide range checks and adjustments (engine coolant strength) including changing the engine oil, oil filter, air filter, (fuel filter or spark Plugs) and top-up screen wash fluid. High quality parts are used and we check and record wear and tear items to give you peace of mind. We’re confident that our menu services will meet or exceed manufacturer standards, however in a small number of cases a manufacturer’s service may be required to protect your warranty, to book a manufacturer’s service call 01925 633373. Our two levels of service are designed to meet the varying needs of cars no matter their age, condition or history. Will my manufacturer's warranty be invalidated if I don't have my car serviced by my dealer? 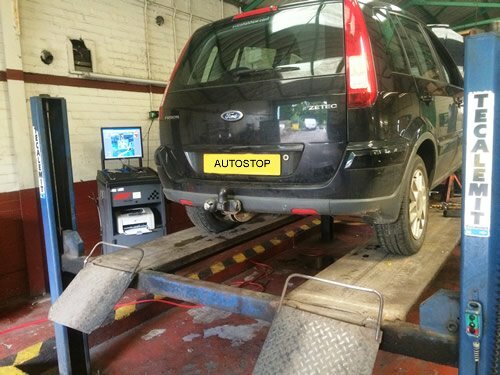 No – Since block exemption legislation was introduced in 2003, Autostop service Centre in Warrington has been able to carry out servicing using Original Equipment (OE) equivalent parts, which ensures your warranty is protected. Yes – all parts used by Autostop Warrington are manufactured to Original Equipment (OE) quality. We’re so confident in the quality of our car servicing, we guarantee all our work and parts for 12 months. Yes – if you would like to have a manufacturer’s service instead of one our menu services, please contact Autostop Service Centre in Warrington for a quote specific to your vehicle. Trust Autostop for car servicing Warrington and we promise we won’t let you down! The majority of our customers have trusted us with their vehicles before and have returned again and again.